The £5bn machine on the Swiss-French border is designed to smash protons together with cataclysmic force. The first - clockwise - beam completed its first circuit of the underground tunnel at just before 0930 BST. The second - anti-clockwise - beam successfully circled the ring after 1400 BST. So far, all the beams have been stopped, or "dumped", after just a few circuits. On Thursday, engineers hoped to inject clockwise and anti-clockwise protons again, but this time they plan to "close the orbit", letting the beams run continuously for a few seconds each. The BBC understands that low-energy collisions could happen in the next few days. This will allow engineers to calibrate instruments, but will not produce data of scientific interest. "There it is," project leader Lyn Evans said when the beam completed its lap. There were cheers in the control room when engineers heard of the successful test. He added later: "We had a very smooth start-up." The LHC is arguably the most complicated and ambitious experiment ever built; the project has been hit by cost overruns, equipment trouble and construction problems. The switch-on itself is two years late. The collider is operated by the European Organization for Nuclear Research - better known by its French acronym Cern. The vast circular tunnel - or "ring" - which runs under the French-Swiss border contains more than 1,000 cylindrical magnets arranged end-to-end. The magnets are there to steer the beam around this vast circuit. Eventually, two proton beams will be steered in opposite directions around the LHC at close to the speed of light, completing about 11,000 laps each second. At allotted points around the tunnel, the beams will cross paths, smashing together near four massive "detectors" that monitor the collisions for interesting events. Scientists are hoping that new sub-atomic particles will emerge, revealing fundamental insights into the nature of the cosmos. "We will be able to see deeper into matter than ever before," said Dr Tara Shears, a particle physicist at the University of Liverpool. "We will be looking at what the Universe was made of billionths of a second after the Big Bang. That is amazing, that really is fantastic." "We know the answer will be found at the LHC," said Jim Virdee, a particle physicist at Imperial College London. The favoured model involves a particle called the Higgs boson - dubbed the "God Particle". According to the theory, particles acquire their mass through interactions with an all-pervading field carried by the Higgs. The latest astronomical observations suggest ordinary matter - such as the galaxies, gas, stars and planets - makes up just 4% of the Universe. The rest is dark matter (23%) and dark energy (73%). Physicists think the LHC could provide clues about the nature of this mysterious "stuff". But Professor Virdee told BBC News: "Nature can surprise us... we have to be ready to detect anything it throws at us." Engineers injected the first low-intensity proton beams into the LHC in August. But they did not go all the way around the ring. Technicians had to be on the lookout for potential problems. Steve Myers, head of the accelerator and beam department, said: "There are on the order of 2,000 magnetic circuits in the machine. This means there are 2,000 power supplies which generate the current which flows in the coils of the magnets." If there was a fault with any of these, he said, it would have stopped the beams. They were also wary of obstacles in the beam pipe which could prevent the protons from completing their first circuit. Mr Myers has experience of the latter problem. 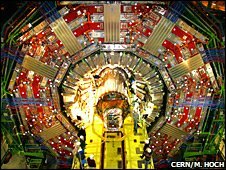 While working on the LHC's predecessor, a machine called the Large-Electron Positron Collider, engineers found two beer bottles wedged into the beam pipe - a deliberate, one-off act of sabotage. The culprits - who were drinking a particular brand that advertising once claimed would "refresh the parts other beers cannot reach" - were never found. In order to get both beams to circulate continuously, engineers will "close the orbit". The beams themselves are made up of several "packets" - each about a metre long - containing billions of protons. The protons would disperse if left to their own devices, so engineers use electrical forces to "grab" them, keeping the particles tightly huddled in packets. Once the beams are captured, the same system of electrical forces is used to give the particles an energetic kick, accelerating them to greater and greater speeds. The idea of the Large Hadron Collider emerged in the early 1980s. The project was eventually approved in 1996 at a cost of 2.6bn Swiss Francs, which amounts to about £1.3bn at present exchange rates. However, Cern underestimated equipment and engineering costs when it set out its original budget, plunging the lab into a cash crisis. 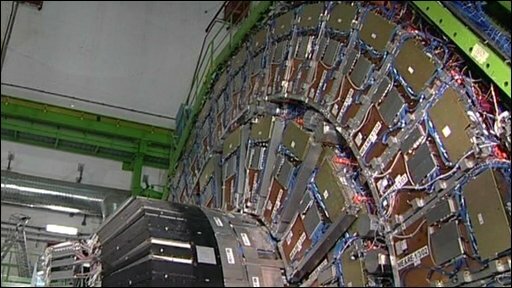 Cern had to borrow hundreds of millions of euros in bank loans to get the LHC completed. Expenditure on the machine and experimental areas has risen by more than half since 1996. During winter, the LHC will be shut down, allowing equipment to be fine-tuned for collisions at full energy. "What's so exciting is that we haven't had a large new facility starting up for years," explained Dr Shears. "Our experiments are so huge, so complex and so expensive that they don't come along very often. When they do, we get all the physics out of them that we can." Engineers celebrated the success with champagne, but a certain brand of beer was not on the menu.